Founded in 1992, the Innovation Network is an educational nonprofit organization that aims to help other nonprofits measure their own results: in providing tools, training and consulting services, the Innovation Network collaborates with nonprofit organizations across sectors and worldwide to demonstrate how evaluation can contribute to better management and the improvement of practices. 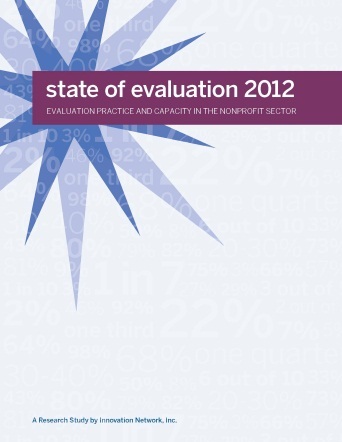 Two years ago, the Innovation Network published State of Evaluation 2010, which presents the perceptions and uses of evaluation in U.S. nonprofits. Based on over a thousand responses to a nationwide survey, the report highlights evaluation capacity and practice in the nonprofit sector. This study is unique in its kind, in a sector where evaluation practice has never before been analyzed in such a meaningful way. The exercise was so successful that near the end of 2012, a second State of Evaluation was published by the Innovation Network. Based on data collected the previous year, the report highlights the importance of evaluation, especially for nonprofits, in maximizing impact and building capacity. The overall message of the reports is an encouraging one: in 2010, 85% of organizations evaluated their work, and in 2012, this number jumped to 90%. Most importantly, while 98% of 2010 respondents claimed to use evaluation findings in their practice, 100% of 2012 responding nonprofits answered that they used and communicated evaluation findings (through reports, in staff or board meetings and via social media). The 2012 report does show, however, that internal capacity for evaluation is not always optimal: for example, only 18% of responding nonprofits indicated having a full-time employee dedicated to evaluation. Furthermore, many organizations did not have a logic model or update it regularly, which, as the report notes, is an important basis for meaningful, long-term evaluation engagement. Nonetheless, in 2012, 79% of respondents felt that evaluation was very important for strengthening future work. We look forward to the 2014 edition of the report, and hopefully further signs of evaluation being used in a widespread, purposeful way.